As we transition form summer to fall – school is beginning and there’s a bit of time to reflect on progress – our societies, our professions, our own. There is a phrase going around lately that if “she sees it she can be it” – relating to the importance of young girls “seeing” women in positions of power and in careers that used to be thought of as only for the boys. This month’s book selection is a collection of stories from these women on the top of technology. Please enjoy. Hashtag #IoUCWomenTech. 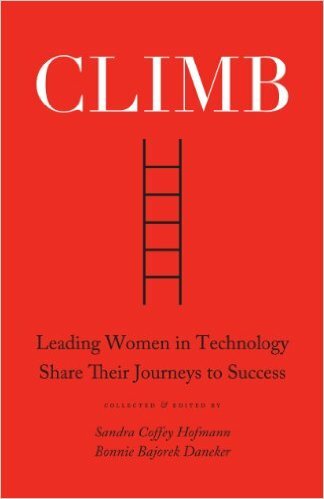 With great warmth and wisdom, Climb delivers compelling stories of women at different career stages succeeding in the technology business community. Powerful, personal and poignant essays depict the varied roads traveled and challenges met by these insightful leaders from an industry where few women venture. Learn why they are passionate about technology careers. Share in their rich experiences. Garner valuable advice to incorporate in your own leadership efforts. From young girls building robots, to a software engineer, to a high-tech lawyer, to a CEO, these stories of women in the South will appeal to readers at various points in their professional lives. They convey the heart and soul of leadership for the next generation. Over 60 executive women contributed essays on their leadership journey and provide great insights into career and life defining moments. A rich testament for development.